Laundry, laundry laundry..... it never ends, huh? So, instead of dreading it, embrace it and be thankful that washer/dryers exist instead of having to wash everything by hand!!! Ugh! 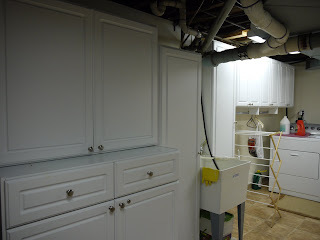 So today I'm giving you some ideas to help simplify your laundry room. If any of you have other ideas that have worked for you, please share with me - I'd love to hear them! Put a small trash basket on top of the dryer for putting dryer lint and other small pocket trash. Place a small basket or magnetic container on top or side of dryer for putting pocket change and other items that will certainly turn up. Install a wall mounted drying rack if possible and appropriate for the room to create more floor space. Use an over-door pull-down ironing board to save space as well. Use a basket for mis-matched socks, to eventually find matches, or simply use as dust-rags after time. While unloading dryer, sort items into different baskets labeled for each family member, then have each family member be responsible for folding and putting away. Have each child have their own laundry basket and wash all their clothes during one session. No sorting involved and that child's clothes are completely finished! Create a clear workspace for placing clean laundry and for folding. Lighting can make or break a laundry room so make sure there's enough of it! If it’s not a cheerful place to go, you will do just about anything besides the laundry.